(Newser) – Bill Clinton's debut novel had the year's biggest opening so far for a work of fiction, reports the AP. The President is Missing, a thriller he co-wrote with James Patterson, sold 250,000 copies its first week. Alfred A. Knopf and Little, Brown and Co., the book's co-publishers, announced Wednesday that the number includes hardcover, e-book, and audio sales. NPD BookScan, which tracks around 85% of print sales, reported sales of 152,000 copies. That's BookScan's top-selling fiction debut since the latest Diary of a Wimpy Kid, which came out last fall, and biggest first week for adult fiction since Harper Lee's Go Set a Watchman sold more than 700,000 hardcover copies in 2015. The book spent much of last week at No. 1 on Amazon.com and elsewhere despite some awkward and contentious moments in interviews with the former president. Clinton responded defensively to questions from NBC's Craig Melvin about the #MeToo movement and whether he owes an apology to former White House intern Monica Lewinsky. The novel begins with a president facing impeachment for supporting terrorism and tells of his efforts to thwart a potentially apocalyptic cyberattack. "By any measure, this was a terrific opening week of sales, one that exceeded even our own optimistic projections," Michael Pietsch, CEO of Little Brown's parent company, Hachette Book Group, said in a statement. "Sales continue apace this week, with Father's Day on the horizon." 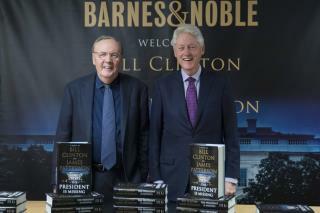 The novel combines Patterson's long background in thrillers and Clinton's perspective as a former president. Reviews ranged from mocking ("Reveals as many secrets about the US government as 'The Pink Panther' reveals about the French government," wrote Ron Charles in the Washington Post) to admiring. In the Wall Street Journal, Barton Swaim called the book "beach reading of a high order." The Clintons both suckering their fan base out of more money. It just never ends with them. Hype pure and simple. Liked, as in past tense, Patterson but anything he wrote with slick willie isn't anything I want to read.